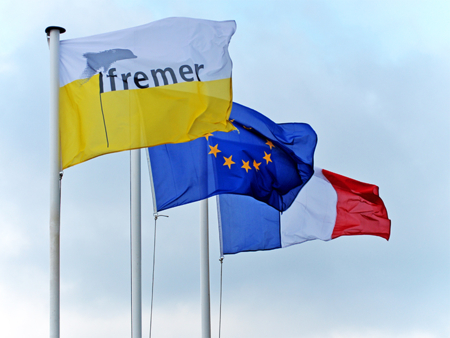 Testing facilities and benches are used for basic research and for product optimisation phases, and for qualification and calibration of instruments developed or used by IFREMER. This specialised testing equipment is located in Brest, Boulogne-Sur-Mer, Lorient and Toulon. Deep water wave tank in Brest: used for testing regular and irregular monodirectional wave behaviour on fixed or slow-speed moving bodies, and hydrodynamic behaviour of slender, flexible objects (anchoring lines, flow lines, umbilical cables). Applications include marine renewable energies and the offshore oil sector. as well as pipe- or cable-laying equipment, vessel-fishing gear coupling, towed marine systems, testing materials before deployment at sea, optimising ROV submarine and diving operations, etc. In the field of marine renewable energies, the wave tank is particularly suitable for wave energy devices and floating wind turbines. The wave tank in Brest is fitted with a wind generator and is exceptionally deep. It is equipped with various measurement devices (hexapod, airborne and subsea optical trajectometry, wave probes, anemometer, uni-and multi-directional force sensors) that are veritable assets for R&D in the marine environment. Wave-current circulation flume tank in Boulogne-sur-Mer: the test tank in Boulogne can evaluate the behaviour of objects in currents or in movement at significant speeds on scale models (or full-scale if the object is small), bottom towed (fishing) gear, propelled or moored devices, fully immersed or buoyant (seismic instruments). In the field of marine renewable energies, the tank is particularly adapted for testing underwater turbines. The test tank in Boulogne-sur-Mer is equipped with a wide panel of accurate measuring instruments specific to hydrodynamics that can record the main mechanical stresses acting on the tested objects as well as monitor and visualise flow and the dynamic behaviour of the model (2D laser Doppler 2D velocimetry, 2D particle image velocimetry, multi-component strain gauge balances, 3D air-water trajectometry system, hexapod). Fishing gear test tank in Lorient: this test tank is specialised in testing fishing gears, usually towed gear but also passive gear, to assist the transition to sustainable practices. Tests are carried out on scale-models and many trawls and trawl doors are available for testing or demonstration. The studies carried out the past few years have addressed ways to cut energy consumption, limit the impact of fishing gear on the seafloor and optimise selective gear to limit bycatch. To carry out these tests in static or dynamic conditions, the tank is equipped with current meters, (mono- and multi-component) dynamometers, motorised arms to lift instruments, an excitation system and a mobile floor. Hydrodynamic tests are periodically conducted to assess innovative designs (fields of marine renewable energy, defence, etc.) and qualify measurement and observation systems for fishing for external business or organisation as a provided service. Test tank for underwater vehicles in La Seyne, at the IFREMER Mediterranean Centre with a surface of 160 m² and a depth of 6 m.
These tanks are mainly dedicated to the development, qualification and acceptance testing of underwater devices (scientific instruments, deep-sea sampling systems, portholes, ROV components, etc.). They can also be used to test and qualify materials intended for use in high-pressure conditions. They have variable capacity (from 0.07 to 1 m in diameter, from 0.1 to 2 m in length) as well as testing pressure (1000 or 2400 bars), thereby meeting the needs of IFREMER and collaborating public or private partners. They can be filled with freshwater or seawater and some can be temperature regulated. Weighing of materials under pressure, measurement of variation in buoyancy, etc. In addition, some ten compression chambers have been specifically deployed for the study of the effect of immersion on composite and polymer material ageing (buoyancy materials, thermal insulation of oil pipelines, etc.). These chambers are unique because they can be used with seawater at intermediate pressures (up to 300 bars) and high temperatures (up to 150°C). IFREMER has classic electromechanical traction systems (capacity from 10 to 200 kN). Combined with immersion ageing in seawater and in deionised water, many tests can be carried out with these machines on the correlation between ageing and modification of mechanical behaviour of polymers and composites. The study of cyclic loading, analysis of elastomer behaviour and rope and cable tests are also carried out using different housings of 25 and 250 kN to carry out fatigue tests on composites in natural seawater or using traction benches to plot fatigue test curves in water and in air and finally on specific benches for rope testing: a high-capacity bench (1000 kN, 8 m in length) and another bench (limited to 300 kN) specially designed for studying synthetic cables on pulleys. In addition to this equipment, shock towers and immersed creep testers complete the mechanical testing resources. IFREMER recently obtained a INSTRON traction machine, 1 m displacement, 10 kN. The environmental testing facilities (cold rooms, warm rooms, temperature humidity rooms, solar radiation) associated with a vibration table are adapted to the specific conditions of the marine environment. An acoustic testing chamber is available for measurements of sensitivity, directivity and impedance on antennas and transducers. The metrology laboratory is equipped with the standard references in oceanography and benches for metrological verification of the quality of measurements recorded by scientific measuring instruments and their calibration in the marine environment (temperature, pressure, dissolved oxygen, fluorescence, salinity, turbidity). It has been accredited by COFRAC for temperature and pressure measurements. The in situ testing station at Sainte-Anne-du-Portzic is located at the mouth of the Bay of Brest, at the foot of the IFREMER campus. It is used for at-sea tests of various instruments and technological developments. The tidal currents are very strong (mean of 1.5 to 2 knots, maximum of 4 knots). 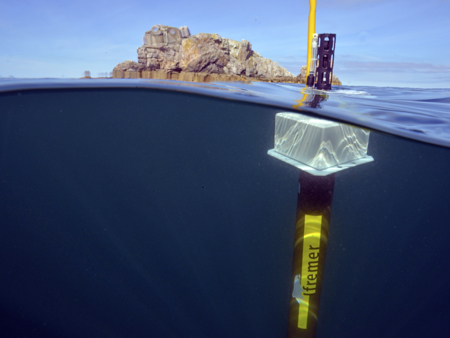 Instrumented buoys carry out continuous recording of physico-chemical parameters in this area, which provides information on the testing conditions during instrument testing campaigns conducted at IFREMER.